I love rice, I try not to eat too much of it at home in Australia….where I am carb conscious …. but there are certain places in the world that you would not dream of skipping it. Italy for example……..or when in Asia it just feels right , breakfast lunch and dinner. There were times when I was in the Cambodian jungle that I prayed I could be eating rice. The jungle is green and dense and full crawling, flying, jumping creatures. If the bugs don’t get you the almost 100% humidity will. You feel tired just putting one foot in front of the other. While you are swatting mosquitoes and sweating, you can only dream of sitting in the shade and eating some fluffy rice. 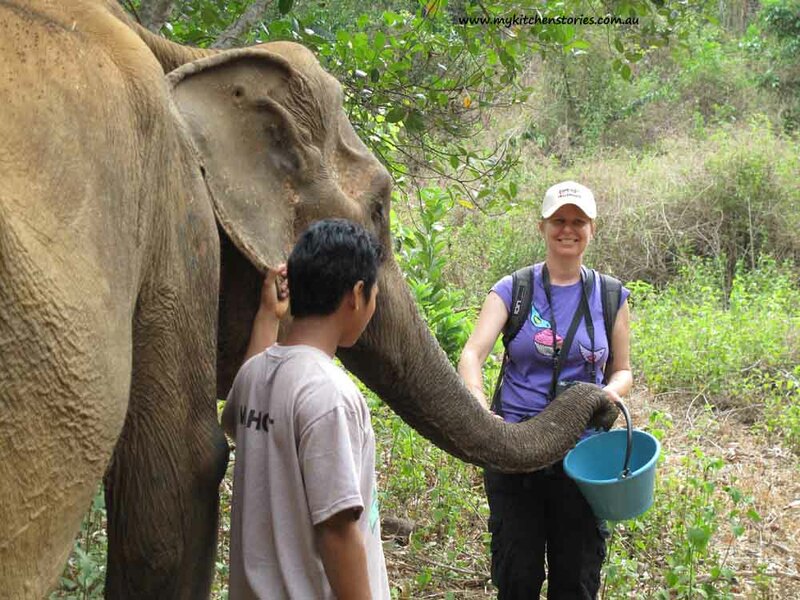 The Elephant Valley Project is in Mondulkiri, a northern province in Cambodia. Here a motley crew of Elephants are living a well deserved life of luxury. After surviving lives of incredible work loads farming and lifting and sometimes being used to carry tourists in painful heavy baskets, they are resting. Some have been tortured and beaten but now spend their days foraging in the jungle, safe and protected. Elephants eat alot; and did you know they are vegetarians? Here they wander the forest uprooting trees and foraging for juicy bits of greenery and sometimes they feel the need to raid local farms that have delicious crops growing, causing all kinds of trouble. Here at the EVP in Cambodia, they are regularly offered Banana palms as a morning treat. These need to be hacked into large chunks before they are shared amongst the herd. They grow on hilly slopes in the sun while the Elephants like to wait in the shade down by the river. 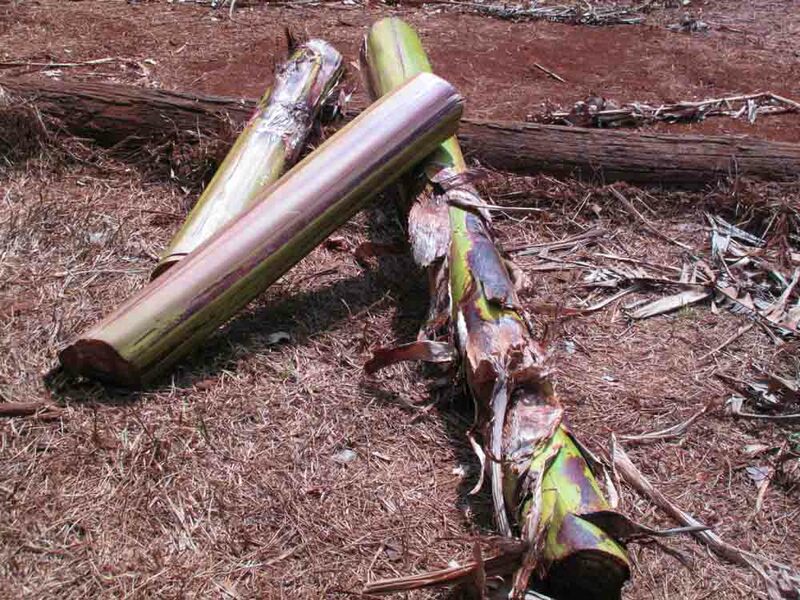 I did say banana palms, the whole tree, yes. Going down a slope generally means you have to go back up. It is incredibly tiring slow work. Food here tastes extra amazing for humans that have been feeding elephants! There were days that we joked about the lunch hooter going off………PRAYED for the lunch hooter. 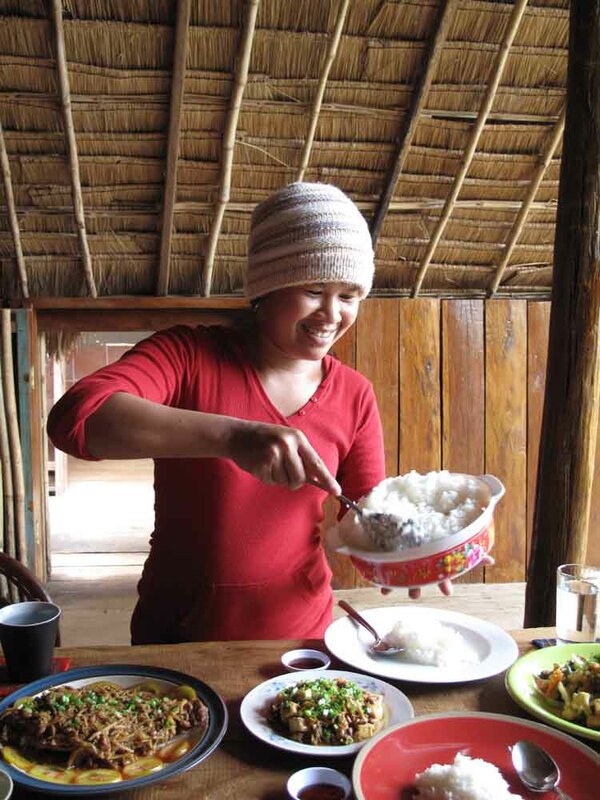 This below is a picture Soki, our smiling lovely Cambodian Cook who seemed to understand our hunger! Give these a try…..I included a layer of salted caramel that you can get a recipe for here (makes a takeaway container, be prepared to use it on other things). Got left over rice?. You could make these great cupcakes. This is an original recipe. You will need 23 cm ( 10") cake tin and set the oven at 180C (350 F) deg for 15-20 minutes. Put the rice and sugar into the food processor and buzz till smooth. Add the eggs, vanilla, almond meal, cocoa powder and baking powder . 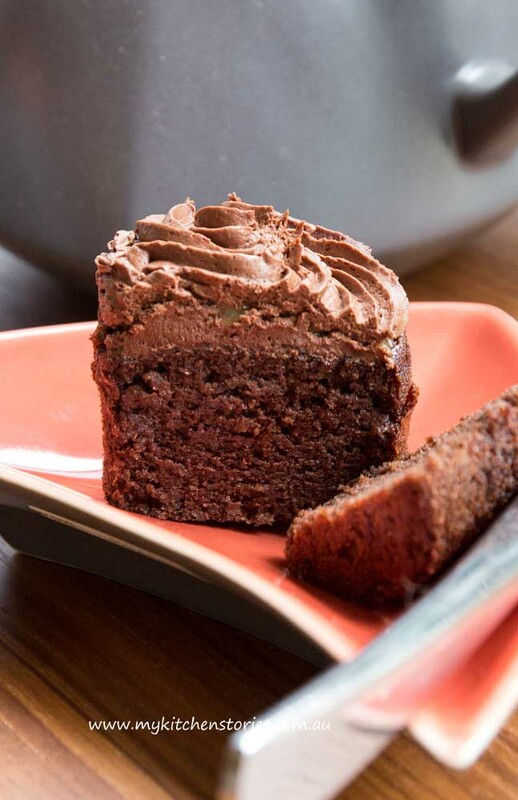 Pour into cupcake papers 3/4 full, or into a 23 cm ( 10") cake tin and bake at 180 C(350 F) deg for 15-20 minutes for cupcakes and 40-45 minutes for a 23 cm. A skewer should come out clean when the cake is tested. Heat the cream in a jug or a sauce pan till warm but not boiling. Take off the heat and add the chocolate . Stir till melted. Cool . Beat in an electric mixer until light and fluffy. Pipe or spread onto the cakes. I spread a layer of salted caramel on the cake before ganaching it. Puree till smooth. This cake has no gluten so won't get tough. As long as I’ve eaten rice, I’ve never used it in a decadent cake like this. Can’t wait to try this recipe! Well I have made this one up. Cant see anything like this anywhere else.Give it go… nice moist rice. Oh at first I thought it was made using rice flour when I saw the title but actual rice! I’m really intrigued! The crumb and texture looks great! Give it a go Lorraine! What an awesome idea! And an awesome adventure too. Love it! Thanks , yes it was an awesome adventure and I am glad i did it! I’ve never eaten a rice cake like this. It looks wonderful and simple to prepare. I can’t get golden syrup here where I live in Mexico (and I do love it so! ), but could probably find a substitute. Thanks for posting the recipe. Victoria at Flavors of the Sun recently posted..Zucchini Sticks: Fried or Baked? Rice and chocolate….what an unique combo! These cupcakes sure look awesome! I have bought the ingredients and I will make it tomorrow. I really want to try some gluten-free recipes. I will link back to you with the recipe when I blog about it. I absolutely loved Cambodia as you might have seen on my last post. The people are so friendly. Cambodia, elephants and scrumptious looking (and probably tasting cake- with salted caramel…!) Bliss! Yes well thats the next choice. There was comfort when I was eating! Celia sent me over to read about the elephants. I’m so glad I came For the elephants and the cake! I am intrigued and since my niece just sent me some golden syrup I actually can and will make this. Thanks! Hello, visit anytime you like elephants or not! What an interesting method. A perfect recipe for the Thermomix. Love the elephant’s tail. Ha Ha to be sure,,,, even when you find chocolate its dodgy isnt it? Imagine if we had a few of these in our hut instead of those damn trail bars that were so crumbly they attracted all manner of insects! Aren’t elephants magnificent creatures? I went to an elephant orphanage in Sri Lanka and just being so close to these huge beasts felt like such a privilege. As for these lovely little tasty chocolate goodies , they sound wonderful. oH how fantastic Sri lanka! Once you get close you just never forget it do you? rice is a VERY surprising ingredient! 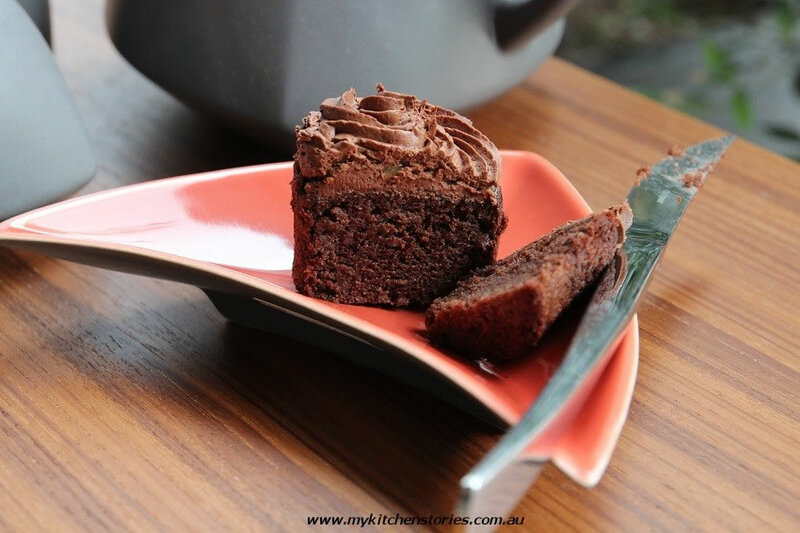 what a perfectly moist cake, tania–well done! grace recently posted..hot diggity dog! Thank you Grace ….. I was amazed when I threw it together and it worked so well. There is a great photo I would like to retake on my trip Africa, with my mum, it was the greatest expeirence of my life, the food was magical, but the photo retake was my mum on an elephant jungle experience. By the way way your recieps are TASTEie, and great. Wow Tania! 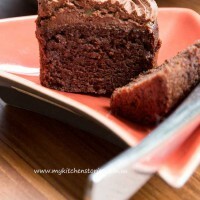 I would have never know that you could used leftover cooked rice to make a scrumptious cake. Definitely have to give this a try and soon. Thanks for sharing. I love your photos. Thanks Nancy. Fancy you saying that to me! Tania I will try the left over rice chocolate cake. Thank you for that the beetroot cus cus will give that a go as well. Love you my kitchen stories. I made this cake tonight using steamed rice leftover from last night’s dinner. The cake was amazingly moist, and had a balanced texture and delicious chocolatey taste as one would expect from a regular (non-GF) chocolate cake. 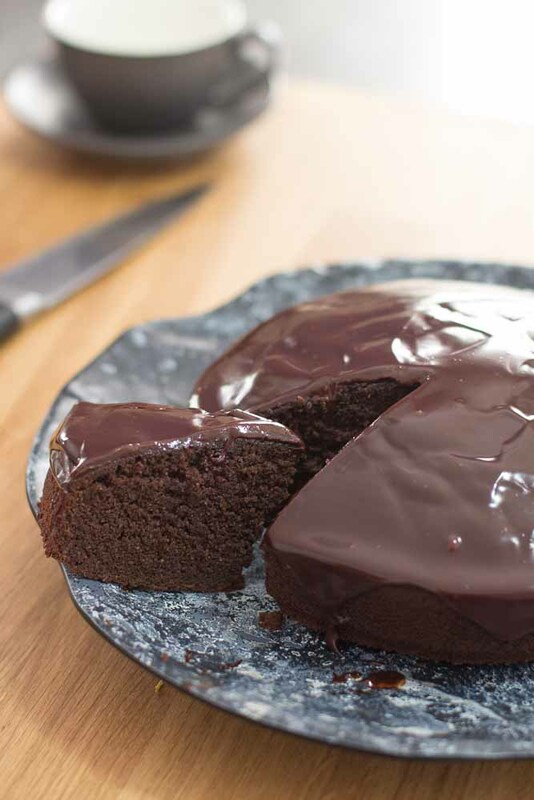 I just love a good cake, but since I don’t eat wheat finding a great cake recipe, particularly one that also suits the palate of my three young children, has been a challenge. Having baked a great many gluten-free cakes, some with more success in the eating than others, I can honestly say this is a winning recipe. Thank you very much for sharing it, Tania. (Note: this cake took 45 minutes to bake in a 23 cm silicone cake ‘tin’ at 180 degrees C). Hi there Tamie. Thank you for being lovely enough to let me know you liked it. I think its a real keeper too. One day I was making orange and almond cake with whole boiled oranges and I wondered what would happen if I used rice instead. I am not sure why I did but the result was this cake and I love it. Again Thanks!